Development of a measurement device for IPv6. 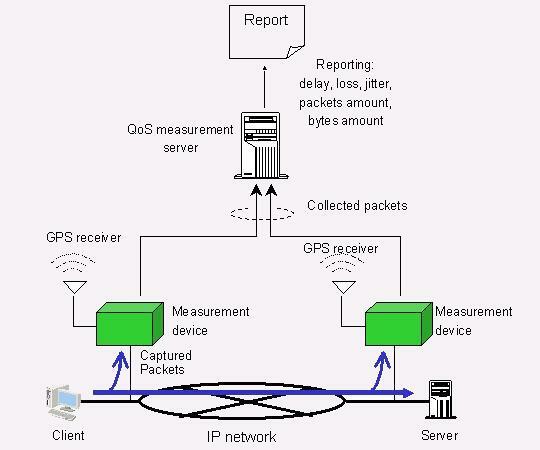 The measurement device inserts precise (micro second order) timestamp information when it captures the IPv6 packet. Each device has time synchronization functionality, by GPS, or any other equivalent mechanism, if widely available. Development of a measurement server. The measurement server collects the captured IPv6 packet. Then it provides not only usage data but also QoS metrics (delay, loss, jitter and so on) for IPv6 traffic by analyzing the collected information through the measurement device. Integration and local test of the developed components, for the further trial and evaluation of the developed system, at least in European IPv6 infrastructures. Generation of a set of guidelines for the possible application and further research of the IPv6 QoS Measurement in different scenarios. Dissemination and Linkage with other related Fora and Projects, in order to publicize the project results. WP2 (Requirement Study for IPv6 QoS Measurement) as a pre-requisite for achieving the project objectives in real large-scale scenarios, and outputs for guidelines. WP3 (Development of IPv6 Measurement Technology)	to address the development of the measurement device and server, and generation of final guidelines. WP4 (System Integration, Testing, and Evaluation). WP5 (Dissemination, Liaison and Interconnection). WP1 offers to the rest of Work Packages both, administrative and technical management skills providing an effective framework to support partnership in achieving the scientific project objectives. WP2 will specify a functional system (modelization of end to end IP flow: end to end network part and client to client part) allowing the measure and making available the quality of service effectively expected by the client. Is also responsible for generating the guidelines for application and further research of the IPv6 QoS measurement concepts in different scenarios. WP3 develops the IPv6 QoS measurement system as a prototype. This system will have many measurement technologies, e.g. IPv6 packet analyzing algorithm, IPv6 QoS measurement algorithm, and so on. This prototype will be tested and validated in real IPv6 network. WP4 will integrate all the developed systems into the test-beds; the will proceed to the system performance testing and finally to the evaluation of the results. WP5 will develop a comprehensive approach and basis for strategies of visibility, dissemination and exploitation of the research results. This WP is also responsible for the coordination/liaison with other related networks and projects, including standardization activities. The expected impact of the project is to ensure the deployment of QoS, IPv6 and affordable broadband access in Europe. Given the fact that the time frame of 6QM project, and the coincidence with two pan-European native IPv6 networks (Euro6IX and 6NET), they will be used as major test-beds to validate the 6QM project, in a pragmatic way. The liaison and the cooperation between 6QM and these projects will lead to study the impact of the characteristics of these networks on the design of measurement tools (probes) and on the specification of the measures (metrics, collection techniques, processing methods, ?). As part of the expected result from 6QM project, a knowledge base and a set of guidelines will be created, that could be exploited by operators and ISPs to meet the client demand in IPv6 advanced services with guaranteed and differentiated QoS.